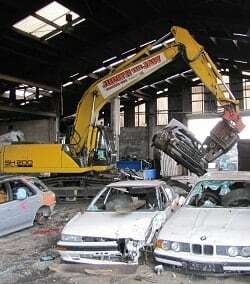 What happens to a vehicle once a car disposal company has collected it? That’s a very important question about car disposal, and the answer varies greatly depending on which car wrecker you choose. Step 1: Gas extraction process. The fuel is removed from the car and is re-used. Other toxic liquids (oil, battery acid, anti-freeze, brake fluids, air conditioning gases, etc.) are also removed from the vehicle for recycling. Step 2: Checking for parts. A checklist is completed to identify which (usable) parts the vehicle still has. Step 3: Removing the usable parts. These are removed manually by one of our car dismantlers. This job takes approximately 1.5 hours per vehicle. Step 4: Containers are loaded. The usable car parts are loaded into containers for export. Step 5: Recycling. Broken car parts and scrap is separated and sent for recycling. 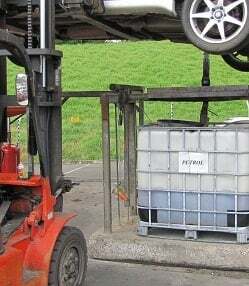 Step 6: Fuel and tyres: the fuel is filtered and reused; and good tyres are sold locally. Step 7: the crusher! The remains of the car body are crushed and sent to the metal recycling plant. Some car disposal companies in NZ will simply crush a car and sell the metal for scrap. They’re not car dismantlers in the true sense, nor do they recycle everything that can be recycled. Instead, they’ll let the toxic fluids (petrol, oil, battery acid, anti-freeze, brake fluids, air conditioning gases, etc.) seep into the ground, which in turn pollutes our waterways, rivers, beaches and oceans. For the sake of yourself, your children, and the environment, make sure you get your old, broken vehicles removed the safe way. Contact Zebra Broken Car Collection Company for your car disposal in NZ: just call our friendly team on 0800 300 426 for a free quote. Remember – you’ll get the best cash price for your car! When you choose Zebra Broken Car Collection Company for your car disposal, you’re not just doing your bit for the NZ environment, but you’ll also get the best possible cash price too!